This boymimics my selling cry like a parrot▲and wouldn't stop. that it sounds like cat? when you cheek adults like this. What? You are welcome, you say? Well, I'm thoroughly helpless against such talkative mouth as yours, boy. Iwami silver mine, now is in Shimane prefecture, was reigned by Edo government directly. Its tribute summed up to 50 thousand Koku, which was called Iwami-ginzan tribute. Administration office was settled in Omori-cho, 59 bugyo / local officials changed the local services. 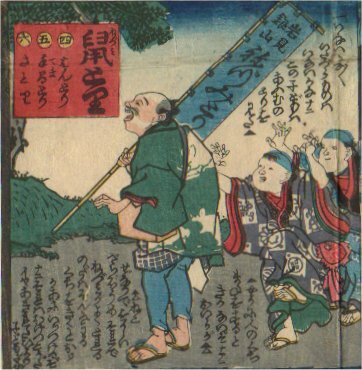 The rats poison from Iwami silver mine was so known its effectiveness that the seller appeared even in Edo.